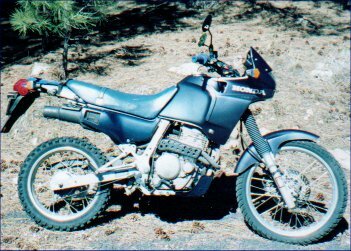 Back in 1988, Honda offered a street version of its popular XL650 dual sport bike. 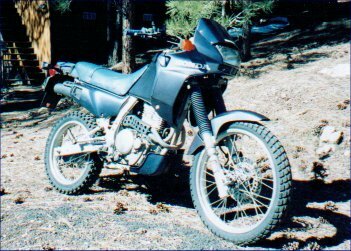 With the addition of some plastic parts and a few mechanical changes, the NX650 was introduced to the American market. Despite its popularity in other countries, where it still lives on as the Dominator, it only lasted two years in the the U.S. This is a project bike that I picked up in the middle of winter, when riding was out of the question. I spent many a snowy weekend patching and painting the plastic fairing and other parts. 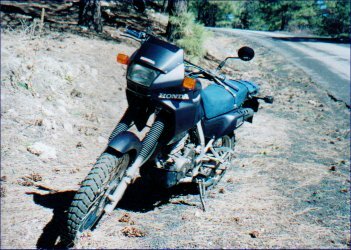 It rides a lot differently than the Transalp, like comparing a Buick to a Yugo. The torquey single-cylinder 650 thumper engine vibrates more noticeably, and the whole bike is lighter. But the power-to-weight ratio makes it a blast to ride!